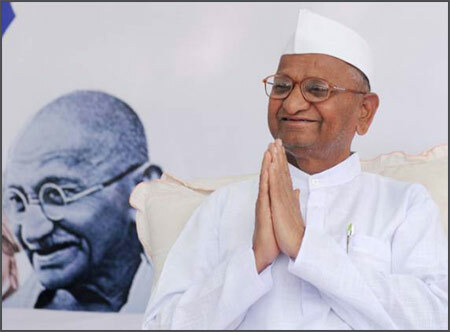 “I am just an instrument of Dharma, He is the embodiment of Dharma” - this statement of Anna Hazare makes a resounding and thrilling entry into our beings. Not that Baba needs ‘authentication’ of any sort but it gives us a measure of the inspiration and power that the very knowledge of His existence gives! But that meeting with Anna Hazare happens to be barely a ‘raisin’ in the ‘cake’ of Mr. Anant Pandey’s life. His life has been a saga of difficulties and struggles but more important, it is testimony to the redeeming and uplifting experience that God’s grace confers. This ‘cake’ of his life has definitely not been a cakewalk but the Lord has His own ways of adding an icing and the cherry on top! Born in Pandeypipra, a village near the holy town of Varanasi (in the state of Uttar Pradesh, North India), Anant has not much idea about the first six years of his life. Thus it was that Anant was cared for and looked after by his grandparents. His grandfather imbued him with sound values of Indian culture and spirituality while his grandmother doted on him. That was when he began his schooling too, walking barefoot (for he could not afford slippers) for about 5-6 kilometers everyday. He was not a student at the school, but was inspired to simply sit near the threshold of the classes and grasp whatever was being said there. 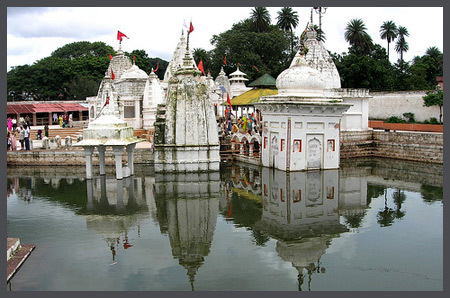 Narmadakund, is the source of the river Narmada. “When I was 11 years old, my grandfather passed away. I had not yet come out of mourning when, within the next year, grandmother too left me. That was the first time father came - for his mother’s funeral. When he arrived, he heard earfuls from the villagers about my plight. Anant was a child after all. He needed support. But even before he could try to accept her as a mother, she had to accept him as a child, right? One day, when the father had gone to work, she fed him with poisoned chapatis! How did he know he was poisoned? Who could blame him? He had always experienced a man who was supposed to be his father - not a father who was supposed to be a man! He told the police about his aunt who lived in nearby Bijuri. So he was taken there and submitted to her. But when he noticed that his aunt was actually in close communication with his father, he ran away from that place too. He was sick of his father’s attitude and did not want anything to do with him. And now he entered the Chatah Mohalla, a sort of an orphanage with Muslim children, and began to live there. 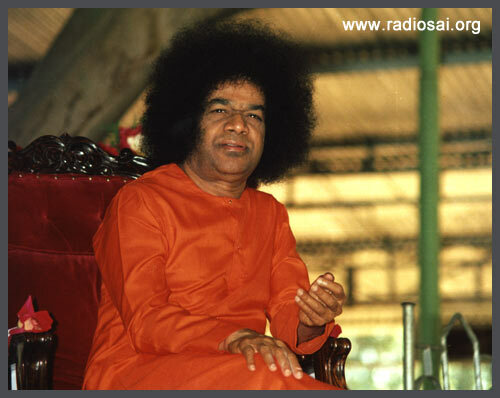 It was at this point that Bhagawan Sri Sathya Sai Baba decided to enter the life of this hapless and helpless child. That night Anant had a dream where a saintly person came and laughed at him, but blessed him with open hands. He felt strange, but also a sense of inner peace. That is the magic of the Lord. Has it not been said that coincidences are miracles where God chooses to be anonymous? And Mr. Giri had been given the photograph for worship by a certain S.K.Urmaliya who was a manager in Central Bank. Out of respect and faith in Mr. Urmaliya, Mr. Giri had begun praying to that photo. Thrilled by this, Anant found the whereabouts of Mr. Urmaliya and eagerly asked about this smiling Sai. He not only learnt some fascinating aspects about Baba, but also was gifted a Bal Vikas book and a photograph by him. He placed this picture along with that of Mother Durga in his little altar to which he prayed, regularly and diligently. Mr. Urmaliya also helped him get a good flat for a nominal rent which he paid from his meagre tuition earnings. He was now coaching children of grade 7 and 8s. 'White-Ash' Appears! Was Baba Conveying, “I'll Reduce Your troubles to Ashes”? “It was the Diwali day - a festival of lights and happiness. 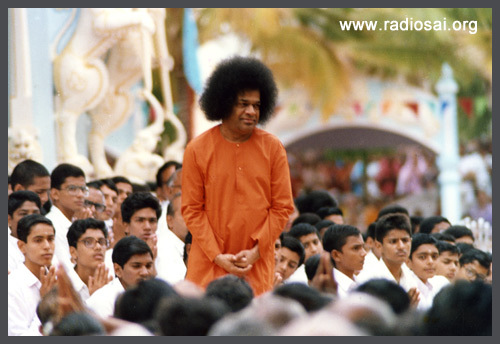 I suddenly observed that there was a lot of grey dust on the photograph of Sathya Sai Baba. And what was bizarre was that when I cleaned up the dust, a lot more came in its place. His entire hair was soon covered with that powder. I reported this to Urmaliya sir and it was then that he informed me about vibhuti. He also told me that I was indeed blessed, and promised to take me to Puttaparthi one day. Life thus continued for Anant. But now, motivated by Mr. Urmaliya, he began to attend village service programmes, but after a while however he lost touch with him. Anant was now in touch with Baba! With new-found enthusiasm and joy he also completed his high schooling with good grades in 1999. He now wanted to pursue engineering but learnt that he would need at least Rs. 5000 (about $120) for admission fees. Obviously there was no way he could have that much money, so he thought of meeting up with Mr. Urmaliya to seek a loan. The gap of more than a year had seen Mr. Urmaliya getting transferred and Anant had no idea as to how he could contact him. The first darshan is often filled with poignant memories. How was it for Anant? When he entered the ashram, the students were filing in for darshan. Anant happened to be dressed in white. He dropped his little bag near the Ganesha Temple and simply walked in along with the students! He was not even aware of what he was doing. “During darshan, Swami came to me and asked in Hindi, 'Where do you come from?' I was simply dumbstruck looking at His glowing face. “He continued, 'Do you study?' I was just lost looking at His wondrous form. He then patted me on my cheek and walked on. “The next day, something wonderful happened. Swami began to wave His right palm in a circular manner near me and out came vibhuti. I was one among the recipients. It felt so wonderful and I was convinced that my God would take care of me. A few days later was Shivarathri and once again Anant in whites got into the hall with the students. He was still unaware of the rules and procedures. Swami gifted him with three chocolates on that holy morning; this ravaged boy was enjoying this regular bounty. However while beautiful things were happening in the mandir, He had almost run out of cash. What was to be his fate? He never had any worries. He knew Swami would take care. “The next day, when I was walking in front of the South Indian Canteen, I was accosted by Mr. Jairam Gandhi. I was pleasantly surprised for he never had told me that he too was coming to Puttaparthi when I had gone to him for the concession form. Then he told me an amazing story. 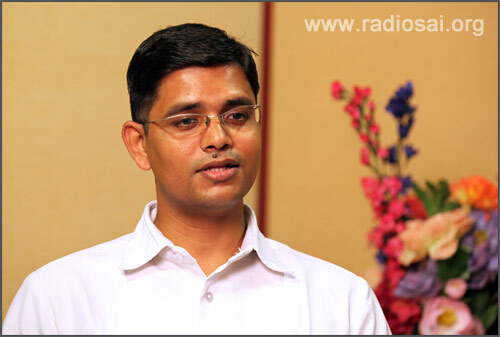 Thus it was that Anant Pandey moved to Indore where he began to pursue his bachelor's degree in science, funded by the large-hearted Sachdeva. What you just read was only the first part of a gripping conversation with Mr. Anant Pandey. We are yet to tell you how this dynamic youngster met social activist, Anna Hazare, and how he took on the management of an established educational institution to uphold an Indian tradition which is so dear to our Swami. We shall bring you the second part of this article shortly.